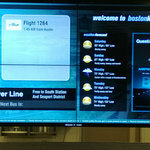 When we finally landed in Boston, the screens above the baggage claim had these very nice displays! 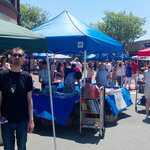 David at the Winchester Town Day. It was hot. At D'Augustino's deli, I was impressed to find Austin's own Stubb's Bar-B-Q Sauce! 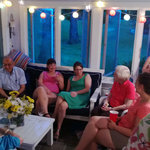 Family members wishing my Grandma a happy birthday! 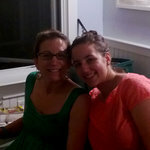 Carrie and my Aunt Rebecca - definitely a family resemblance! We played a rousing game of bocce. Grandma and Grandpa in the solarium. Carrie and Chris in the solarium. David and I in the backyard. 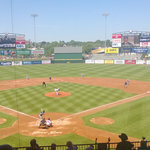 We went to see the Pawtucket Red Sox play. 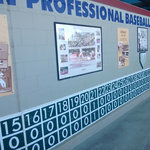 At the stadium there was an exhibit about the longest game ever played! 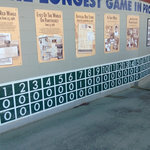 Part 2 of the exhibit - the game was 33 innings long! We had good seats, and it was a great day for baseball! 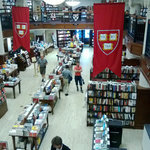 The Harvard Coop had lots of good books, even if it was just a reskinned Barnes & Noble. 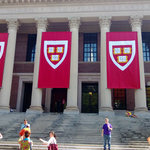 Me on the steps of the Harvard Library. 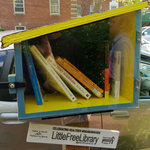 On the way back to our car we saw this adorable little library! You could take the books and everything!